After running away from his impostors posing as his parents, Kyp Finnegan is lost in Chimera. 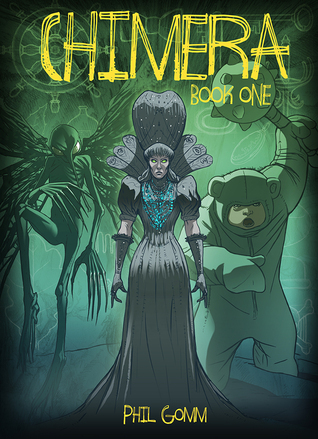 Chimera a dangerous world where lost things are placed and evolve into dangerous creatures. With the help of Atticus, a sock snake, Kyp must avoid the biggest danger of them all Madame Chartreuse, who wants to imprison him in Chimera forever. This wasn’t for me . . . at all. This book reminded me of the Chronicles of Narina, which I didn’t appreciate at all. The story just jumped right into Kyp and him becoming lost. The back-story didn’t show up until almost the 6th chapter which causes confusion. I was literally in awe at how I know nothing about the character other than the fact that his parents aren’t really his parents. Eventually I do come to know about the character but at that point I was just disappointed with the book. The author doesn’t completely explain Chimera. Yes, I am aware it is a place for lost things and they evolve but something huge was missing and I felt that the author didn’t develop his ideas enough, The imagination was there and I felt a passion within the author’s words but it felt like a rip off. Overall, I didn’t enjoy this book. This is not to say that someone else may not like it. It lacked complete originality, character development and a consistent flow and order of ideas.